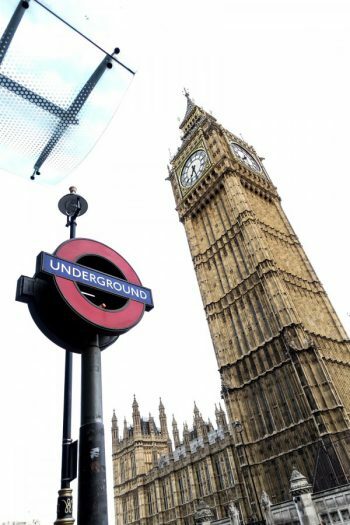 And again I am sharing a post with pictures we didn’t take for the blog but only for Instagram. The day I was wearing this outfit I just wanted to take outfit pictures for IG, and the plan was to put on the outfit another day again when we would have enough time to take pictures for the blog. Well, as you might guess, I didn’t wear it again since then, and we focused on other outfits, that’s why we didn’t take any proper outfit pictures with the lens we usually use. 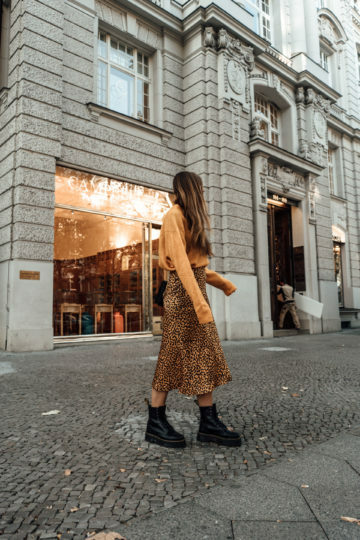 BUT I do like the pictures we took for Instagram a lot, and I really wanted to share this outfit on the blog, and that’s why I decided just to use these pictures and share them here as well. Do you guys even mind, if the pictures aren’t taken with the other lens? Or do you like the others better? 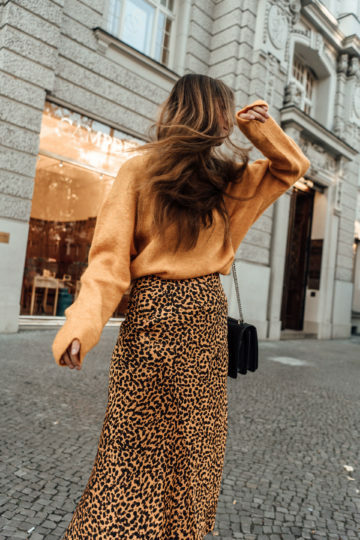 In today’s post, I want to talk about how you can wear leopard print in winter. Well, the outfit might not really look like a winter outfit and to be honest, I was wearing it on an autumn day. But you can easily transform this autumn outfit into a winter outfit by adding only two pieces: a pair of tights and a coat. I would go for either a long white or a long black coat with this look. 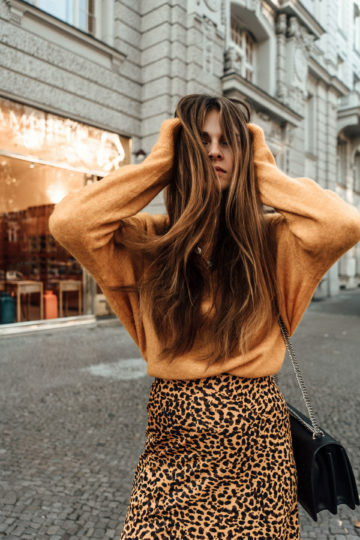 Leopard print is one of the trends you could see everywhere this year. Mostly in summer, but also in spring and autumn. So why not wear it in winter as well? 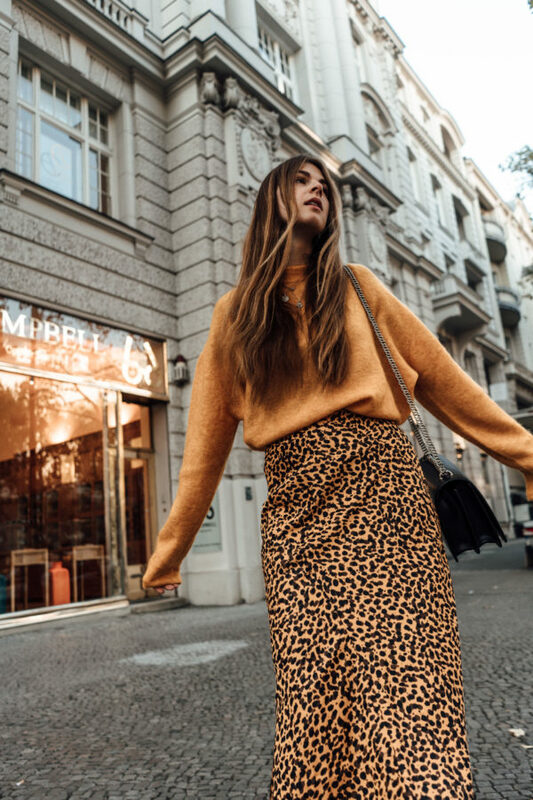 There are a few fewer pieces available in stores at the moment, but that’s also because of another animal print trend that just popped up: the snake print. 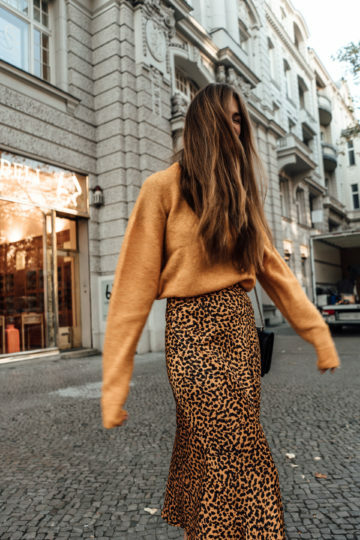 Nevertheless, leopard print is still a thing. 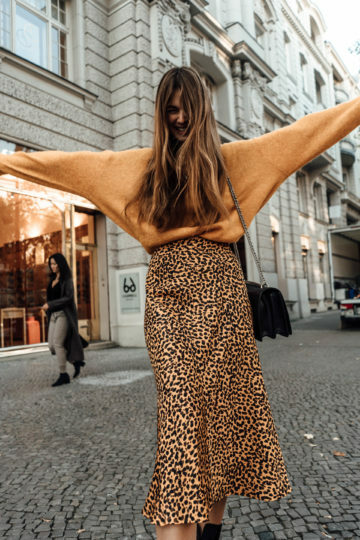 And even though you can’t find as many pieces as you used to in summer in stores anymore, you can wear the ones you already have in winter as well. 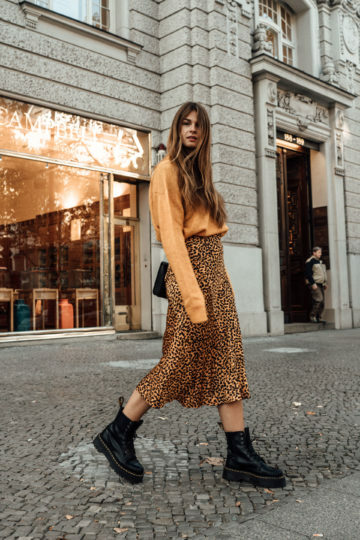 Layer your leopard print shirt with a turtleneck underneath or a camisole on top. 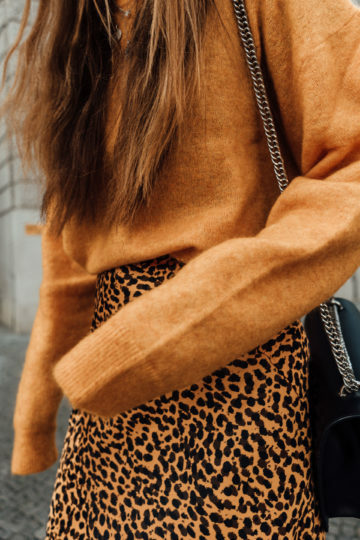 Style your leopard print dress with a pair of jeans and your leopard print skirt with a cosy and warm sweater. The latter is what I did the other day. I opted for a sweater with a similar colour to the one of the skirt for a matchy outfit. Due to that, I created a look that pops out and makes dark and grey winter days a little bit brighter. Looking at these pictures, I really feel the need of wearing this look again. It’s so cold and dark in Berlin at the moment; I definitely need some colour to brighten up my days!